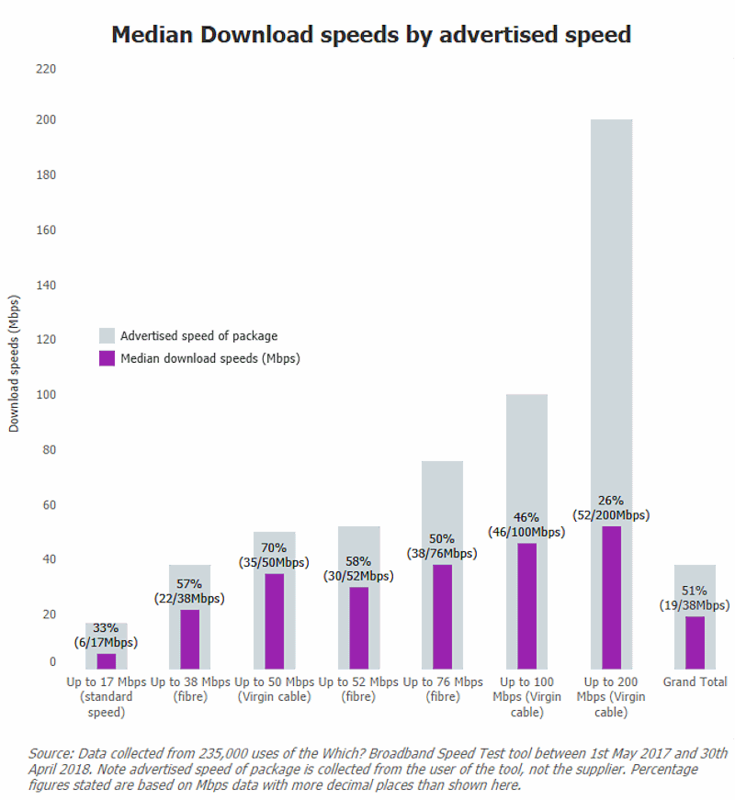 Next week a change in UK advertising guidelines will mean that broadband ISPs need to start promoting “average download speeds” (a MEDIAN measured at peak time 8-10pm) on their public packages (details). But a new study by Which? suggests that some may end up over estimating their averages. The consumer magazine claims to have conducted 235,000 speedtests via their own checker tool (between 1st May 2017 to 30th April 2018), which then appear to have been filtered in order to identify which product was being tested. On top of that they also filtered out any results from mobile and “exclusively” business providers (the latter suggests they couldn’t filter out all business connections that are domestic grade). In terms of the results, Which? found that customers of so-called ‘up to’ 17Mbps (ADSL2+) standard broadband packages only received a median average download of just 6Mbps (33% of the currently advertised rate), while ‘up to’ 38Mbps (FTTC / VDSL2) services typically delivered an average of 22Mbps (57% of the current rate) and even Virgin Media’s 200Mbps tier only produced 52Mbps (26% of the current rate). The results are interesting, particularly because a couple of ISPs have already adopted the Advertising Standards Authority’s (ASA) new rules and so we can do a simple comparison. For example, Sky Broadband and the Post Office have both converted their ‘up to 17Mbps’ service to promote an average of 11Mbps (vs the 6Mbps above) and their ‘up to 38Mbps’ tier is now an average of 34Mbps and 35Mbps respectively (vs the 22Mbps above). Overall Which? claims that British households are paying for broadband services that are on average 51% slower than CURRENTLY advertised (existing rules allow ISPs to show a speed from the fastest 10% of users on a package). Of course this is Which? and that means there are potentially some very crucial caveats to their data, which aren’t stated in the press release and so we assume they haven’t been considered. Perhaps the biggest problem here is that consumer speedtest based data, particularly when clumped together from lots of users without significantly deeper filtering, is inherently unreliable as a comparison of package performance. The reason for that is because the results can be influenced by all sorts of different factors, such as slow WiFi, the local network load at the time a connection was tested (e.g. testing while somebody else is still using the connection), poor home wiring, limitations of the device conducting a test, limits of the speed testing server itself and so forth. The above caveats are one of the reasons why ISPs will most likely base their own estimates on more direct measurements of line performance, which won’t need to worry about the more variable impact of WiFi or network load in your home etc. Ofcom’s most recent fixed broadband speeds report (here), which was based on tests conducted via specialised routers, produced much more favourable results. However we understand that the regulator’s averages were a MEAN rather than a MEDIAN value, which means they can’t be 100% trusted either. This just goes to show how difficult it is to get an accurate or reasonably accurate idea of the actual performance that a particular package from any given ISP and connection technology can deliver. We’ve added a comment from Gigaclear below, although it’s worth noting that not even FTTP/H providers are immune to the caveats of consumer based speedtests. “The Which? Report reinforces what we already know – the British public are struggling with, and paying for, broadband speeds that are far lower than advertised. While it is vital that broadband adverts offer an accurate reflection of the service that will be provided, the broadband providers who still rely on a copper network will always struggle to deliver the performance and reliability that consumers have paid for. The following is a statement from the UK Internet Service Providers Association (ISPA). ISPA supports the new Advertising Standards Agency (ASA) guidelines coming into force next week which require ISPs to include a median average speed available to at least half of households at peak times. ISPA believes this is an important step in increasing consumer understanding of broadband speeds expectations. ISPA members are committed to meeting the new obligations regarding median averages, and clearly setting out all the relevant information to consumers before they sign up. 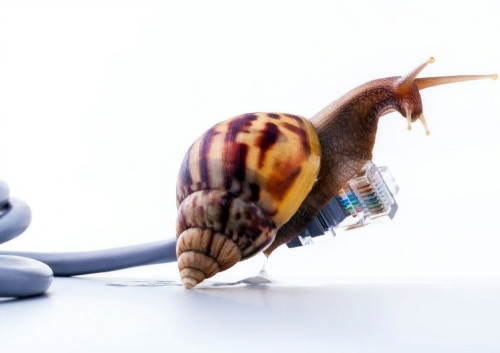 It is important to note that broadband speeds are subject to contention and not a dedicated service, and it is important for consumers to be aware that while speeds may appear slower due to this, it is also possible to receive the maximum at times. Consumers should also view speeds as one part of the overall package available to them, and also consider reliability, price and customer support. There are a multitude of factors that can impact broadband speeds in households, many of which are outside of an ISP’s control, including the number of devices sharing a connection and wiring of a household. ISPA would urge consumers experiencing problems to contact their provider to gain greater understanding of how they could improve their speed within their home. Our members are consistently investing in their networks to provide faster and more consistent connections across the UK. This is reflected in Ofcom’s recent figures show that average broadband speeds have more doubled since 2014 to 46.2Mbps by November 2017. Yep Which are getting as bad as Watchdog with their lets swab something which has physical dirt on it and then be shocked there is bacteria. In my head it made sense 🙂 . Corrected. Is the Which? report not highly unreliable ? anybody testing their internet speed is usually doing so because they feel like their internet connection is running slow, due to a line fault or someone else using up bandwidth in the household. The speeds reported are often also going to be taken over wireless devices, so speeds are going to be lower than the actual downlink speed to the modem/router, especially on older smartphones in larger houses where reception is poor. I don’t often agree with BT and Virgin etc, but in this instance I do potentially believe them. My PC is hooked up over Cat6 ethernet, and my downlink speed on BT’s FTTC is exactly 79,999kbps – the max possible. I get the full speed at all times of day, no matter the time. Atleast in my area, line contention is not an issue. When they were testing washing machines and other white goods etc they seemed to have a handle on how to test and fully documented what they did – I quit my subscription when I felt there were just as useful sources out there for free. I just don’t have confidence in their understanding and testing anymore. 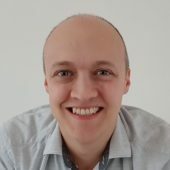 It seems they are hiding behind “this is what the customer can measure” whereas a) they don’t seem to use existing testers since there were already issues raised with theirs last time, and b) as Mark has pointed out in the article there are many legit ways that the results can be confused. People test their speed for all sorts of reasons, not least to confirm that they are receiving what was ordered. This can be helpful provided you do a bit of self-filtering to ensure nothing else is using the network and it’s via a wired link etc. Luckily I haven’t had a problem with speed in years but I do keep tabs and do the occasional test, much like how I keep an eye on the MPG in my car because that can help you to spot a developing problem. I’m one of those people Mark, I’ve got a custom built network monitoring system running on a Raspberry pi to spot any problems. It SSHs into my main router, runs a multi and single threaded iperf test, and then an upstream and downstream UDP test to measure jitter. We may need to differentiate between the speed of the line and the the users experience of the internet. The problem with any speed test is where it is hosted, its capacity and its connectivity from your particular ISP. Their are so many variables and their impacts including the devices used to test and how they are connected. So only general conclusions can be made. However the above does correspond with my experience of VM VIVID 200 during 2017 where stalling and buffering was experienced on things like iPlayer and Netflix on evening peaks. Speed is not the only factor in delivering content but the faster the connection it covers up the other issues. Speed should be measurable via the network equipment. The internet service really should be measured to a basket of common content providers e.g Netflix (fast.com) if we can get those providers to host speed testers. A new speed tester would then be able to record the composite of results. This would also confirm whether ISP’s like Gigaclear can rightly be so confident. Another important thing I’d like to mention is noise margins and Dynamic Line Management (DLM). DLM kicks in when there are frequent disconnections. If DLM detects that noise margins are not stable and cannot maintain for example 6.0dB or 3.0dB in your router stats then the internet connection speed will drop to a lower speed in order for DLM to find the most reliable and stable connection speed without further drop-outs or noise margin instability. I never ever receive 17Mbps in speedtests. The highest I have however received was 16.60 Mbps even if I remove the hidden master test socket. But you see the problem with that is that the connection never remains stable at that speed! If internet drops as a result of low noise margin, heavy rain, lightning, etc. There’s a dramatic drop in the speed. So the speed test can drop to as low as 11 Mbps in my case and remain there until you reboot your router. But the vicious cycle will of-course repeat itself whenever the speed tries to be synced at a higher speed. Something people forget is that it’s not all about the advertised speeds, forget about that! Even if you get those speeds the line will not necessarily be able to cope and maintain that stable connection. According to my postcode I was supposed to receive 19 Mbps. That is what I had in the router DownStream Connection Speed stat, but speed test will be much lower than that. So everytime the internet will drop-out the router will re-sync at a lower connection speed and stay there regardless of what kind of router I use or use a wired connection. What we need to figure out is what is the highest connection speed a particular household can get without the internet dropping out. In my case it will be between 12-14 Mbps with 9.0-11.0dB Noise Margin that’s when my connection won’t drop for weeks on. But every time the connection tries to be faster than that, the internet will drop within a few hours or a couple of days. This has been the case regardless of which ISP I sign up to. That’s why for the last few years I have stayed with Sky because it’s pointless switching ISP, you won’t get a more stable or faster connection if that copper cable is the cause of all of our problems! The bottom line like Matthew Hare, CEO of Gigaclear says our only permanent solution to this old problem will be FTTP. Not even FTTC/G.Fast because again that century old copper cable will once again cause problems. In reply to some of the comments I would say it is pointless testing your speed via a cable connection when in the real world you will be using WiFi 100% of the time, I can just envision the average home with cables running all over the property and people constantly tripping over them. Don’t forget the wireless routers are provided by the ISP’s who should be providing the best available not the cheapest, you should see the one Utility Warehouse sent me, saying that they use Talk Talk so it’s hardly surprising it’s a bag of manure. As I have already mentioned in my post, although I did not mention that I use high quality gold plated certified Ethernet cables for all 4 devices that are connected to my router. One of them is used for my Satellite Receiver the rest are all connected to desktop computers. I never ever use WiFi or WiFi adaptors to connect to the internet from my router. I have long 10-15 meter cables that travel tidily across the walls of the apartment that don’t have any visual obstruction or issues with tripping over. We have even drilled small holes to the walls in the corner so that the ethernet cable will travel through each room only so that we avoid using WiFi adaptors at all cost. I can assure you the connection speed is the same for all 3 computers no matter which router you use or what ISP you sign up to. Connection speed and reliability has mostly everything to do with the internal and external copper cabling. Poor cabling/distance to exchange and quality of copper will determine connection speed and reliability. 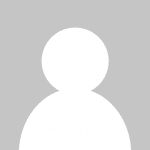 Take a look at this article here. https://spectruminternet.com/news-views/uks-broadband-future/ To copy and paste one paragraph at the bottom of that long article. “Poor knowledge about the copper network – BT does not have a clear record on the quality, positioning and connectivity of the copper network at the local level. The quality of the copper wire varies widely, depending on whether it is pure copper, a copper aluminium alloy, copper-coated aluminium or even just aluminium, all of variable thickness and of differing lengths to the premises, with a corresponding impact on the throughput of data. I hope this clarifies all of our misunderstandings. @Rahul – gold plated ethernet cables? You have been totally conned. My SkyBox, Desktop, TV and laptop space (for my work laptop) all use Cat5e. The only wifi devices are my wifes laptop, the mobiles, tablets and the PS4. Any gamer will be using cables to reduce latency… recommended by almost every gaming site. So I use a cabled connection pretty much 100% of the time. As for testing over wifi… is it the ISPs fault that you may have high concentration ferrous walls and thus have poorer wifi than someone else ? Testing over cable eliminates these variables and provides a consistent testing field. Count me as another with a wired house. I actually avoid wifi when ever i can. If i buy a new device and it has an Ethernet port for internet access that is how i connect it. About the only thing that uses wifi in my house would be if i use my mobile phone over it, which is rare if im home and have access to my actual computer for browsing etc. Can not say i have ever fell over wires either probably because the bulk of it is in cable trunking. Wifi is IMO rubbish and unreliable, if you use it you can not expect your connection to perform to its best. First rule of WFI is don’t use unless you don’t have to, use wired instead. Unfortunately more products are being launched WIFI only. Second rule is turn if off when you don’t need it (appropriate network configuration so you can). That is for performance, security and your health. @TheFacts: Actually I haven’t been conned. 😉 I am aware that there’s basically no major differences if at all between the gold plated ethernet cables and the non plated ones. But I once had an older cable shorter in length, a poorer quality ethernet cable that was producing lower speeds in speed test compared to all my other devices. Somewhere around 0.2 Mbps, that would be around 200 Kbps. So I decided to buy new cables longer in length as I needed longer cables anyway as it was a little bit of a stretch going into my other living room PC. I saw gold plated certified ones on amazon Cat7 which weren’t significantly more expensive, so I decided to purchase those for the benefit of the doubt. My speedtest results were immediately rectified and equal across all 3 computers. I also prefer cables instead of WiFi as you get consistent results every time. I have a WiFi adaptor as well which I once used a few years ago and speed test was definitely lower, but it’s handy for laptops or if you plan to travel abroad in a hotel where you have no option but to use WiFi then it’s fine. But if you want lower ping, latency and of-course a peace of mind about connection stability then Ethernet cables is what I’ll use every time given the opportunity that way you can be sure that if your connection does go down then it’s the internet connection! I always login to my router stats to check to see if it’s the connection or not that way you can rule out all doubts. I have a ridiculously powerful router and can get full speeds from my Virgin Media Business service throughout the property thought I appreciate mileage can and will vary. This just gets worse and worse. The fundamental problem is that (for DSL lines at least), the speed you get depends on how far you are from the exchange. Giving an ‘up to’ figure misled no-one, providing it was made clear that the speed you get depends on your line and might be a lot less than the ‘up to’ speed. Using a 90th percentile figure and calling it ‘up to’ misleads 10% of subscribers. Using an average it’s even harder to relate the headline figure to the speed you might actually achieve. Is ISP A slower than ISP B simply because ISP A’s subscribers live, on average, further from the exchange? What’s even more worrying is that, as someone unlucky enough to live at the end of a very long piece of copper, I get, at best 2Mbps. Are ISPs going to reject my order because it will lower their average? I agree with you that the changes from the original “up to” system are increasingly more complex and less useful, have only been implemented to dumb things down to suit the lowest common denominator, play to the gallery. Far better to have left things as they were, just added a mandatory speed estimate. After all, the people unable to comprehend the original system are even less likely to understand the new one. And you rightly point out that ISPs are incentivised to turn away those on slower lines to bump up their average numbers, something that didn’t affect the original system. It’s not clear to me how anyone benefits from the new system! As for Which?, it’s about time it is called out for continually publishing drivel on broadband. Relying on extremely dodgy “research” in order to publish reports for the sole purpose of getting easy headlines from a lazy press is exactly the sort of shady practice that it would rightly castigate others for yet it has done this itself repeatedly over several years. It’s a real shame that it has lowered its standards so much, this nonsense undermines its reputation. Is it worth it no matter how many cheap column inches it generates in the short-term? I doubt it! So two tests one after another recorded 320Mb then 58Mb. Number of concurrent connections seems variable. Followed by 386Mb/s then 39.9Mb/s. Also noteworthy is that they rely on customers to provide the tier of service they are subscribed to, further self-selecting an already self-selecting cohort of those that use their speedtest. The tester appears, at first impression, unreliable and the methodology itself is likewise unreliable.